Redshirt freshman Shamire Devine is from East Point, Georgia, where he attended Tri-Cities High School. Out of high school, he was considered Georgia’s top offensive line prospect. This season, he was part of an offensive line that allowed an ACC best 0.79 sacks a game and paved the way for Tech’s rushing attack, ranked second best in the nation. With All-American right guard Shaq Mason graduating this year, Devine is expected to play a large role in the coming seasons. He enjoys sleep, video games, and horror movies and is majoring in Computer Science. Technique: Why did you choose to come to Tech? Devine: I wanted to get a great program and degree. I didn’t really have aspirations to go to college when I was in high school until I met Coach Buzz Preston. He told me about all the things I could learn and get out of Tech, and it built into what I wanted to do, plus I got an athletic scholarship. Technique: You used to play offensive tackle in high school. 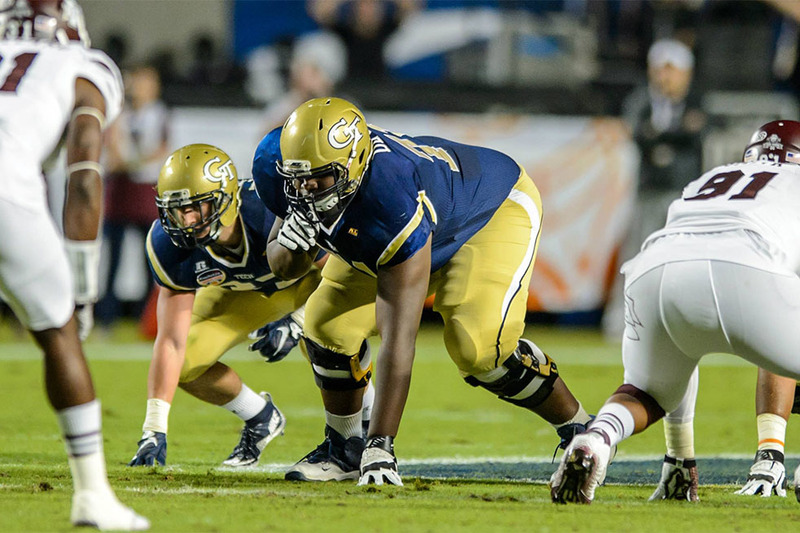 Did you experience any challenges switching from tackle to guard in college, especially when protecting the triple option? Devine: No, not at all. I didn’t know what the triple option was. It was football. I came out here to do my job. I played every position on the offensive and defensive line in high school. Technique: What did you think of this past season? The students thought it was great. Devine: It was a season. Just another season. We just have to get better. Technique: Now that Shaq Mason is graduating, do you think you’ll end up replacing him at right guard? Devine: I don’t know. I’d feel better at left guard, but if coach wants to put me at right, then I’m at right. Technique: Did Mason give you any tips or motivation for the future? Technique: You’re from Georgia, so what did beating UGA mean to you? Devine: It felt great that I could get on Facebook and be like “Ha Ha, who won now?” Everyone was sending me pictures, like my old offensive lineman coach, the one that coaches [at UGA] now. He graduated from UGA and was an offensive lineman. He sent me a picture from 1900-something of him pancaking a Georgia Tech defensive lineman. I sent that picture back [after we won,] but it’s reversed now. Technique: What’s your favorite memory of the Orange Bowl? Devine: Playing that community college in volleyball on the beach outside the hotel. We lost terribly by like 12 points, but it was the best part. Technique: What are your goals for spring training and then summer? Devine: Lose fat, gain muscle. Technique: Your Twitter bio says you like gaming, anime and horror movies, and you’re the coolest guy ever. Devine: That’s all true. That is all true. Technique: What are your favorite two horror movies? Devine: Amityville Horror—the first one and the remake—and House on Haunted Hill. Technique: What video games do you like to play? Devine: I play them all, I’m not really picky. It just can’t be trash. I play League of Legends, Call of Duty. I play it all. Technique: What kind of anime do you watch? Technique: Anything else you want to say? Devine: To all the Tech students out there, it is hard, it is rough. Just do it.